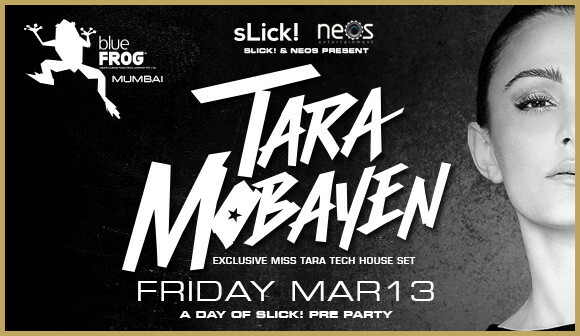 Miss Tara will be laying down a very special exclusive tech-house set at Blue Frog Mumbai. blueFROG and sLick! had teamed up to present an evening filled with party and pleasure. The main event and the main tracks and beats were at Tara Mobayen DJ Miss Tara’s disposal and so were the hearts and minds of those in attendance at Bombay. Miss Tara performed under her own name (Tara Mobayen) that she use more for underground and Tech House sets. Many of her Music tracks and stirred and shook the dance floor on the 13th of March 2015. The part kicked off officially for late evening at 10 a.m. and was scheduled to end at late midnight around 1 a.m. Tara Mobayen’s boundless music takes its participants on an audio oddysey unlike anything felt before. A bonding between those in reception of her message and melodies takes hold. A charisma and style that is bourn from Tara Mobayen days in the fashion and modeling industry that manifest themselves in the ultimate orchestrated sets and performances crafted by DJ Miss Tara aka Tara Mobayen herself. In India expectations were high and the realization never felt short of that high. DJ Miss Tara’s loyal fan base that spans the globe as in all continents multiplying the love of her endearing listeners, a love so great that takes her across even the oceans and into one of the most populated countries in the world, India. A night of spellbinding music, beaming lights of fantasy, boundless love, and a message for those who believe in the words of peace and perseverance. The night in BlueFROG will assuredly stay within the yearning reach of those who attended. To reach Tara Mobayen / DJ Miss Tara and keep up to date on her next scheduled event or relive some of your memories by listening to your favorite tracks, simply hop onto the internet and venture over to see.misstaraofficial.com. If you were touched by any of DJ Miss Tara’s music, then stay tuned for her next album “Let Live” featuring some of the music industry’s well known artists, including one of India’s brightest and eclectic.